Built to ISO Standard 4184. SP series V-belts were the forerunners of the RMA deep wedge, high capacity V-belt sections. Built to ISO Standard 4184. SP series V-belts were the forerunners of the RMA deep wedge, high capacity V-belt sections. These deep-wedge belts (38°) allow for more power, high-speed ratios, smaller center distances and more compact drives. These V-belts also have the UniMatch® feature. This eliminates belt set matching with its multiple stocking problems. Non-standard lengths are available on special order. Special Constructions – Available in raw edge cogged construction by special order (XPZ, XPA, XPB). Up to 2240mm in all sections. 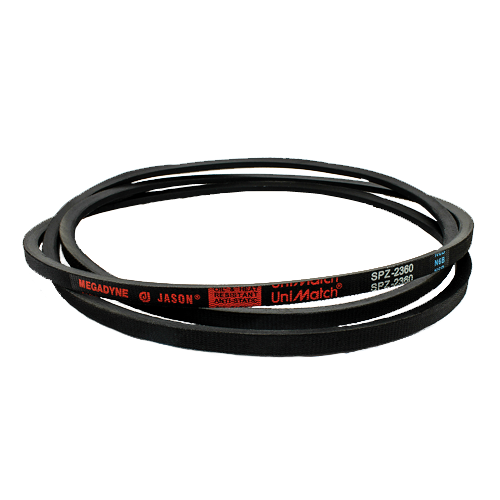 Are you interested in UniMatch SP series Metric V-belts?